Over 25 million existing homes have crawl spaces instead of a full basement. Crawl space encapsulation may help to manage moisture in a crawl space. Moisture and humidity in this area beneath your home can lead to mold growth, musty odors, and structural damage and can also attract insects and small animals. Moisture here can affect your entire home because your home continually draws in air from your crawl space circulating it throughout your living area. This is the air you and your family are breathing in all day and it could cause health problems -- from simple allergies to severe infections. A damp crawl space can increase your heating and cooling costs as well as affect your day-to-day comfort level with cold floors, drafts, and high humidity levels. 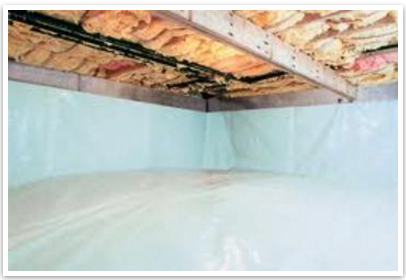 ​Call us to learn how encapsulating your crawl space will benefit your home! We can create a moisture- and humidity-controlled environment in your crawl space using a vapor barrier to encapsulate the ground. We then place a layer of insulation on top of the vapor barrier which prevents it from absorbing moisture. Sealing a crawl space from ground soil and outside air will not only help stop moisture, dampness from entering the home, but also insects and possibly other small animals. Adding or installing insulation helps with energy efficiency and lowering energy bills. Bryan Locke at Morrissey Boulevard, Boston repairing a cracked concrete culvert.